We are delighted to launch the Arts 4 Dementia Royal Parks Half Marathon 2019 campaign to transform the lives of people with dementia and their carers through artistic stimulation which overrides symptoms and empowers them to rekindle fulfilling, active life in the community. 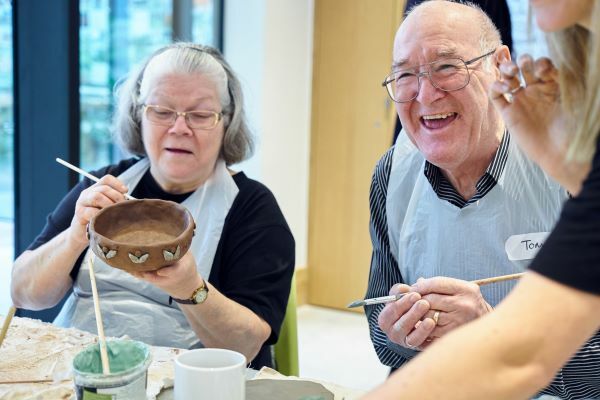 Arts engagement makes a huge impact on people affected by dementia, offering inspiration, a sense of joy and purpose and boosting self confidence - and can delay progression of symptoms. Arts 4 Dementia was founded in 2011 and develops arts programmes to empower, re-energise and inspire people with early stage dementia and carers through challenging artistic stimulation, to help them live better for longer in their own homes. Our signposting website lists and maps local arts events nationwide for people living with dementia in the community, serving both those often desperate for stimulation and providers. Our early stage and dementia awareness training for arts facilitators enables them to deliver effective workshops. The 700+ arts facilitators trained to date will in 2019 deliver arts events to over 13,000 people affected by dementia and their carers. A4D focuses on what people can[/i] achieve, often much more than they imagine. You will need to set a target of £500 (with a minimum pledge of £350) and pay a donation of £25 through the A4D website to register. If you like the idea of running and raising funds for A4D, and would like to run for us in the 2019 Royal Parks Half Marathon, email admin@arts4dementia.org.uk, put RPHM RUN in the subject line and be sure to include in the text your full name and mobile. This popular half marathon has won the Best Outdoor Event at the renowned Event Awards,and this year’s ballot was oversubscribed NINE times! If you would like to run, contact us right away! The 13.1 mile route passes through Hyde Park, Kensington Gardens, St James’s Park and Green Park. Runners have great views of the capital's landmarks including Buckingham Palace, the London Eye, the Houses of Parliament and the Royal Albert Hall.